Top Left: Combination corkscrew, cap lifter, screwdriver, button hook, and gas key. Marked PAT PENDING. Advertising is "Metal States Novelty Co., Salt Lake City." Top Middle: Mini mother-of-pearl legs marked GRAEF & SCHMIDT, GERMANY with fluted wire helix. Purchased by boat. For the story of the "buy" see on the internet: Boating for Corkscrews. Top Right: The camel opener is Design Patent #69,235 by Everett Irving Rogers Jr. of Providence, Rhode Island issued January 12, 1926. Bottom Left: All blades of the extraordinary glass with mother of pearl scales are marked Novelty Cutlery Co. On February 8, 1883 George W. Korn of New York was granted German patent number 21125 for his "Korkenzieher." On August 28, 1883 Korn received U. S. Patent Number 283,900 entitled "Cork Turner." Some knives with a worm which is "popped up" by depressing the foil cutter are marked KORN'S PATENT. The patent drawing, however, shows a two prong blade. This knife has the pop up worm mechanism. Bottom Middle: 2 1/4" bottle shape knife with tortoise shell handles. The knife has a cigar cutter, a pricker, and a cork puller. 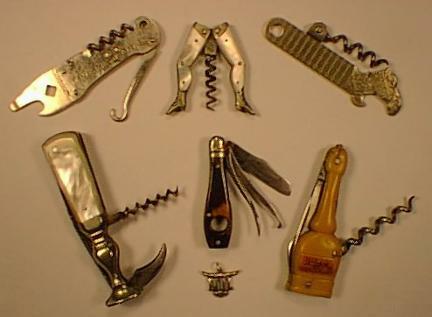 The cork puller is like William T. Vallandingham's April 7, 1908 American Patent Number 883,988. Bottom Right: A bottle shape knife advertising "Lucca Company, Hamburg, Lucca Liqueur Extra Fine" on celluloid handles. Knife blade is marked J. H. BECKER, OHLIGS, SOLINGEN. c.1901-1919.